In late 1997, drummer Chris Black decided to prove wrong those who said heavy metal was a dead art. Nearby bassist Chris Kerns liked the odds. Guitarist Matt Johnsen meanwhile volunteered his wizardry, and the three went to work. By 1999, they had an album’s worth of material demoed and a powerful name: Pharaoh. There was a label ready to release two songs on a compilation. There was a cheap studio available for recording. But there was no singer. From out of nowhere (actually, through a mutual friend), the phenomenal voice of Tim Aymar gave Pharaoh its final, defining element. An experienced singer (Control Denied, Psycho Scream) with power to spare, Tim dove right into the album the group had already begun to piece together. 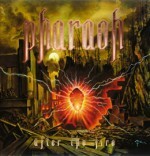 With all four bandmembers actively contributing, Pharaoh continued to work as a session project and eventually completed its full-length debut in late 2002. The Italian label Cruz del Sur turned more than a few heads with the April 2003 release of Pharaoh’s first album, After the Fire. The response from the worldwide heavy metal underground was immediate and encouraging. After the Fire’s broad yet incisive songwriting attracted growing clusters of enthusiastic fans. Matt Johnsen’s taut riffing and explosive solo technique meshed with an aggressive, intuitive rhythm section to aptly demonstrate Pharaoh’s broad vocabulary. But it was the vocal performance of Tim Aymar bringing everything into focus, from the headbanging romp of “Heart of the Enemy” to the imaginative and intensive fan favorite “Now is the Time”. Pleased with the modest success of After the Fire, the group picked up their individual pens to begin experimenting with the ideas that had been tested on the debut. By the end of 2004, the blueprints for an entire new album had been demoed, and the band was eager to return to its natural habitat: the studio. Entitling its new album The Longest Night, Pharaoh spent much of 2005 at MCR Studios under the guidance of Matt Crooks, who had recently worked with Twisted Tower Dire and Division. Crooks’ skill and experience made possible a fresh and stylish Pharaoh album that changes with each song and grows with each successive listen. The vast, clear production highlights the band’s dashing musicianship as the album indulges the listener in songs both contemplative and confronting. Songs like “By the Night Sky” and “Endlessly” show a band that grows quickly and has a seemingly unlimited range. A scene-stealing guest spot from OHM guitarist Chris Poland adds to the depth of tech-tinged opener “Sunrise”, and distinctive album artwork from Jean-Pascal Fournier perfectly embodies the energy found within. The Longest Night closes in as 2006 begins, and Cruz del Sur is ready to launch it like a flaming arrow straight into the hungry hearts of the metal faithful. A vast and adventurous album awaits the world, full of bold songwriting, larger-than-life guitar, and a performance that cements Tim Aymar’s standing as one of the most commanding voices in metal. Like no other album, The Longest Night is at once telepathic and electric, ancient and consummately evolved.